The full history of your heart rate measurement is available in the Health Mate™ app. Click here for more information. Make sure your Steel HR is properly positioned. Make sure you wear your Steel HR tightly enough. It shouldn't be able to move around your wrist. Make sure you've launched the continuous heart rate mode before starting your activity. 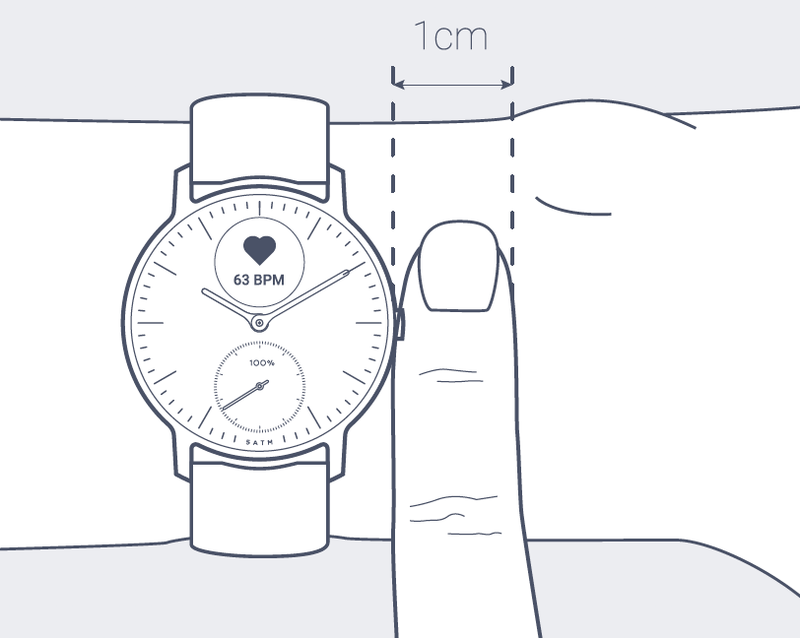 It can take up to 20 seconds for the first HR measurement to be displayed on your watch. Make sure the sensor below your watch emits a blinking green light when the watch display is on. Please note that because of the clenched position the wrist is flexed in when cycling, the heart rate measurements may have some inaccuracies. You can position your Steel HR on the lower part of your wrist. Note that we cannot guarantee the accuracy of the heart rate data, because the product is not aimed to be positioned on the lower part of your wrist. Click here to see how to adjust your Steel HR if you are having issues with your heart rate data.